Venue Information - including capacity and seating chart. 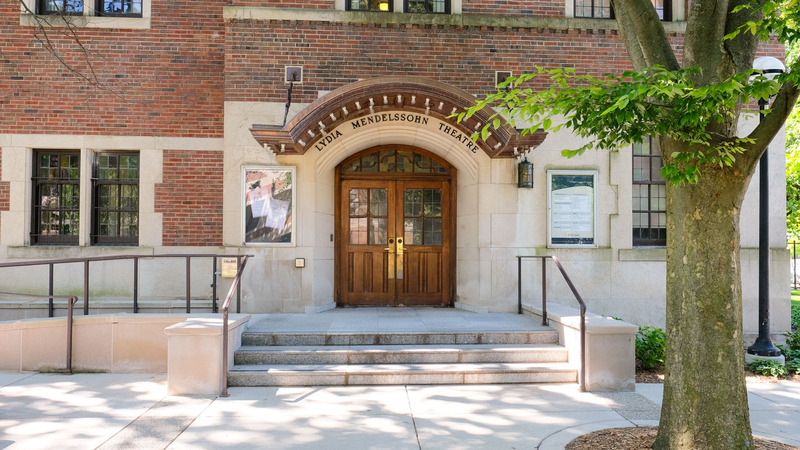 Located within the Michigan League building on the central campus of the University of Michigan, the Lydia Mendelssohn Theatre is an intimate, shoe-box theater. Decorated with solid oak paneling that creates an atmosphere of elegance and charm, the Mendelssohn Theatre is perfect for smaller conferences. Just down the hallway in the Michigan League are similarly designed, tasteful private dining rooms and a large ballroom. The Mendelssohn Theatre is also used extensively for theatrical productions and solo recitals. Opening on May 4, 1929, the theatre was designed by the Chicago architectural firm of Allen Pond & Pond, Martin & Lloyd. In 1995, new carpeting and seats were installed, and the proscenium curtain was replaced. Its lighting equipment is modern. The Mendelssohn Theatre is one of the few theaters in the United States to have a "cyclorama," a curved wall at the back of the stage. The cyclorama improves sound in the theater and can be used for creative lighting effects.